Since my previous phase detection experiment allows me to locate the phase to ~1/100 second I can use this to create a very fine tuned detector. The point is that I do not have the typical uncertainity about the pulse length and what it means. Since the clock is already locked to the phase I can just average in the two 100 ms windows at the start of each second to derive the bits. Any pulses in the trailing 800ms become completely irrelevant. These two 100 ms windows are the time slots between the dotted lines in the picture below. Unfortunately at higher noise levels the decoded bits may have a significant error rate. So the next intermediate goal is to find the start of the second. As I already outlined in the phase detection experiment we need a way to reduce the average amount of data that goes into the equation. Let’s have a look at the DCF77 encoding scheme. In the clean signal there is always a “sync mark” at the last second of the minute. In addition there is a 0 at second 0 and a 1 at second 20. Attention: I did NOT say that the sync mark is at second 59. It is at the last second of the minute. This is very often the same but unfortunately not always. The issue is caused by leap seconds. My DCF77 introduction contains more details on this. We will have to deal with this in a later experiment. For now we will ignore it. 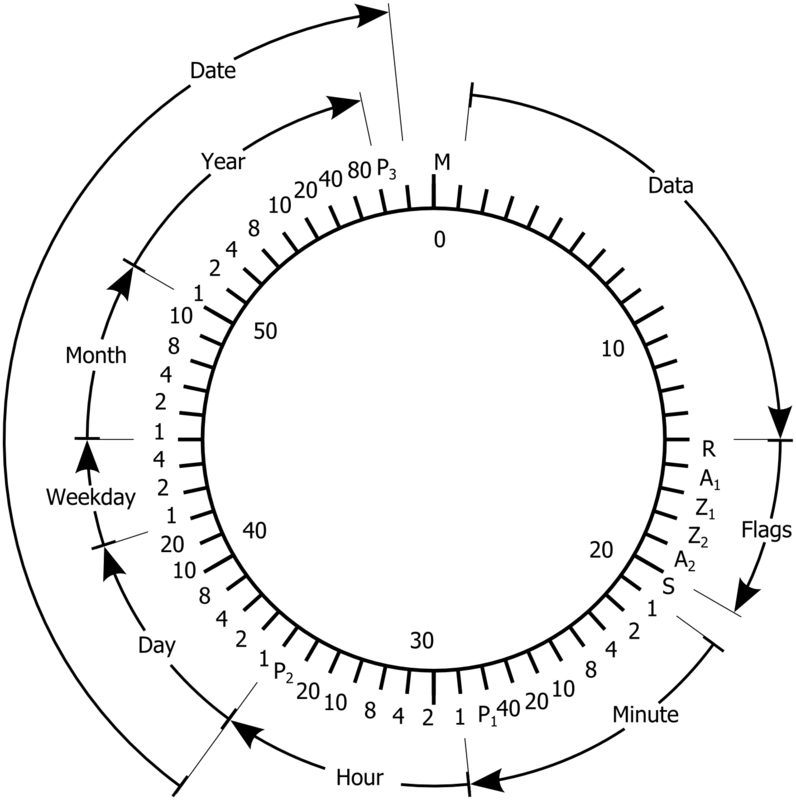 Also we have no clue where the minute starts we know that every 60 seconds we should see this pattern repeat somewhere in the signal train. Thus the idea is to have 60 “bins”. In each bin we collect evidence for the desired pattern. The bin with the highest score should be the searched for start of the signal pattern. 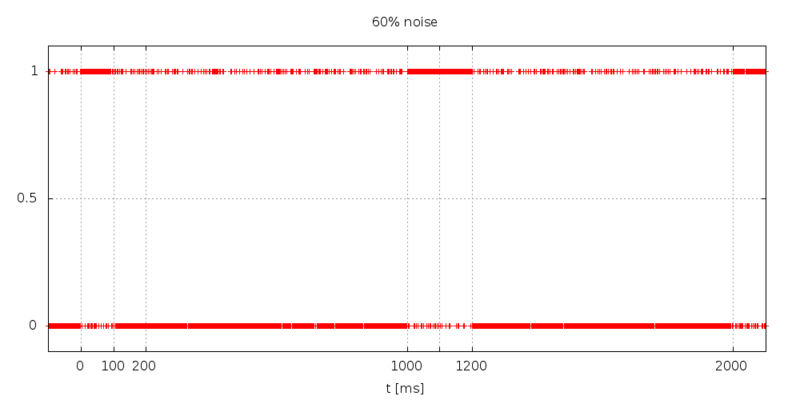 With other words we now implement a phase detector for the signal train. If you look at the way I score the different values you will notice that I score 6 points for a detected sync mark but only 1 point for a zero or one in the proper position. This is not by chance. This approximates the relative entropy of these different signals. The sync mark appears roughly 1 out of 60 in the clean signal. The zeros or ones appear roughly 1 out of 2 in the clean signal. Thus the information gain should be for the sync mark and for the other data. For a pretty clean signal this is a very robust approach. For a noisy signal I needed to add some means to ensure that bins that do not fit the pattern will collect scores as well. Hence I added the degrading scores for mismatches. As you might notice this is not 100% clean. In theory every sync mark that is seen should reduce the score of all other bins. In order to reduce CPU and RAM consumption I did not implement it that way. Otherwise I would have required at least two bytes per bin (to store the fractional part). And I would have required significantly more CPU cycles. Right now this is not an issue but I still need to add the stages for decoding the rest of the signal. Instead I implemented this pragmatic distribution approach. If you analyze the limits that are introduced by the 1 byte per bin setup you will find that I will collect data of up to 1 hour to determine the seconds phase. So far this provided me with very good results. If you have such a weak signal that this is insufficient you need to extend the bin size to words (uint16_t) and set the upper limits accordingly. Alternatively you should get a significantly better receiver and even more important a better antenna. So much for the theory – here is the code. //    the question is: which start up behaviour do we prefer? // We use a binning approach to find out the proper phase. // Bit position  0 after a proper sync is a 0. // Bit position 20 after a proper sync is a 1. //   5) Scores have an upper limit of 255 and a lower limit of 0. // may move up/down the whole scale in slightly below 64 minutes. // We will compute the integrals over 200ms. // The integrals is used to find the window of maximum signal strength. // max_index indicates the position of the 200ms second signal window. // averaging has already happened to some extend. // noise I test with a phase shift of 200ms. // might consume runtime otherwise. // this is also a good place for a "monitoring hook"
// output signal of the DCF module. // Blinkenlighty or Blinkenlight shield. Before we go through the implementation details lets have a look at the overall structure of the code. The basic architecture is still simple. Every millisecond timer 2 triggers its interupt handler. The handler will sample the DCF77 clock module output and feeds the result into the detector stage. This is a slight extension of the phase lock code. I added “stage 2” in order to decode the data bits. The output of this detector is then fed to the clock controller which passes the data on to the second decoder. At first glance the controller looks somewhat unnecessary. However in the future there will be more decoders (for the minutes, the hours, the months and so on). The task of the controller will be to coordinate these decoders. I introduce it already because the overall structure is still simple enough. Hopefully this makes the whole project easier to understand. The implementation utilizes some techniques that are not to common in the Arduino community. First I make heavy use of namespaces. This is a simple means to structure your program. Especially it allows to have different variables and functions with virtually the same name. Actually the namespaces are part of the names thus the names only look the same. This is a way to structure programs into different parts that can be used even if you want to avoid libraries or object oriented techniques. Right now I do not want to use libraries such that everything will reside in one flat file (and can be copied and pasted into the IDE). I also do not want to use object oriented techniques because they provide no significant benefits in this specific context. The other thing that I use are so called templates. Basically these allow to define special functions where you can pass parameters at compile time. These parameters may be numbers or even types. Thus you can have dedicated type specific functions. This allows me to reduce the amount of code. You may want to play around with my code to figure out how they work. I will make more use of them in the future experiments. A final word about the Hamming and DCF77 namespaces. Right now these look somewhat strange. They are to small. However they will grow as I add more decoders. Then their use will become clear. For the time being just assume that these are places for some “utility” functions and reusable type definitions. So how does this code perform in reality? Lets have a small look at the debug output while my tumbler is running. The tumbler generates enough undesirable noise such that none of my commercial DCF77 clocks can decode the signal. I used this to implement a binary (BCD coded) second display. Have a look at the video and notice how the signal fluctuates due to the tumbler. Still the clock works like a charm. At 1:21 I switch on two fluorescent lights that were positioned 20 cm away from the antenna. As you can see the receiver completely loses the signal. Still the clock keeps on running. It was running for ~30 minutes before and it was completely phase locked (“Max Index” close to the upper limit). Thus it would take more than 10 minutes to get it out of phase. Could you please be a little bit more specific? For which URLs does this happen? Does it happen always or sporadic?